Marshall, Paule. "Brazil." Soul Clap Hands and Sing. Washington, D.C: Howard University Press, 1988. 131-77. 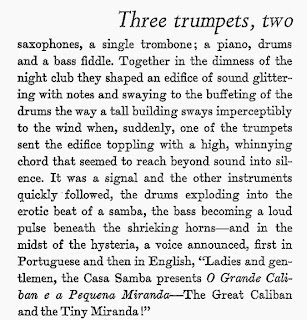 In her 1961 short story "Brazil" (one of four long short stories in the volume Soul Clap Hands and Sing), African-American author Paule Marshall interestingly re-imagines Caliban. The opening of the story is in the image to the right (click on it to enlarge it). 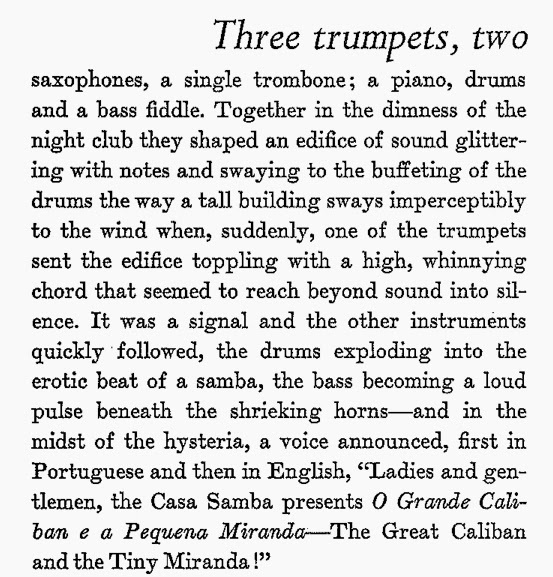 It sets the stage of a nightclub in Brazil and its long-time headlining show: The Great Caliban and the Tiny Miranda. We soon learn that Miranda is a very tall white woman and Caliban is an extremely diminutive black man. The story is leisurely in its teasing out the relationships and the setting. Caliban is set to retire soon—as he's threatened many times before—and the two performers are barely on speaking terms. As he ponders his retirement, we find Caliban in something of an identity crisis. 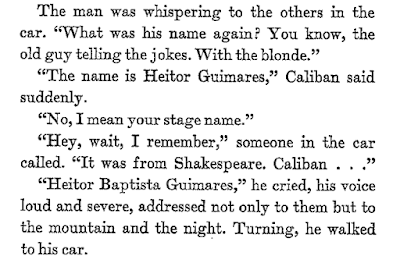 Everyone calls him "Senhor Caliban" or "Caliban"—even his young wife—and he thinks that he's forgotten who he's meant to be. 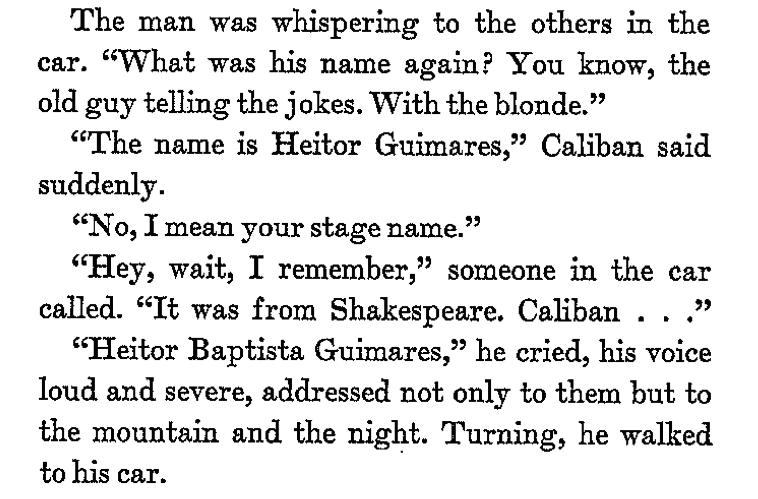 The story continues for some time with Heitor / Caliban trying to figure out who he is—is he who he was born or who the public considers him to be? It's a remarkable exploration of the nature of identity.